The Jumbo Cord Extra Large 6ft Bean Sofa™ Lounger can easily fit two fully grown adults or a whole bunch of kids! 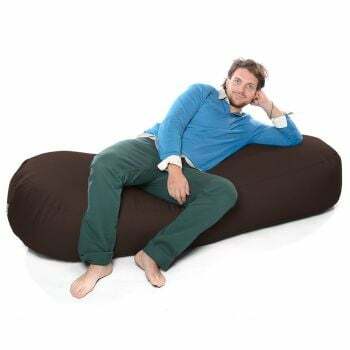 This beanbag can also be used as an occasional bed for anyone under 6ft too. It is also perfect for extra seating or just chilling out on while watching TV. When purchasing the Jumbo Cord Extra Large 6ft Bean Sofa Lounger, you will receive a discounted easYfill™ Liner. The fabric is comfy, strong, colourful and can be machine washed at 30°. You may want to consider taking advantage of the easYfill™ liner deal (discounted when bought with this beanbag), this will enable you to transfer the beans from the beanbag if you wish to machine wash it. Why not add extra beads for Jumbo Cord Extra Large 6ft Bean Sofa™ Lounger at a discounted price when purchasing this product. Good range, recommended you to my sons. Great quality and price speedy delivery and great to sleep on too. Very long beanbag! Does the job perfectly.